How do you find the customers that will be happy to pay? The second is “How can I find the right customers for my business?” meaning clients that will appreciate your solution and will pay the price your product or service worth. How to decide who your customers should be? What are the first steps that will lead you to achieving your goals? It often seems that we as entrepreneurs or business owners are all looking for the same thing. We all want to earn money, right? I don’t think so. Yes, we need money in order to live, and yes, money is the clearest indication that the business is successful. However, there are many other goals entrepreneurs want to achieve. One of the startups that I’m working with invented a seat that helps elderly and other people with mobility limitation to sit and stand with a push of a button. This entrepreneur is excited about the change this product can bring to elderly people enabling them to maintain their independency. His second objective is to build a big global brand and an internationally successful company. And his third objective is definitely to “make money”. There are quite a few successful famous entrepreneurs that, although I haven’t spoken with them, I’m sure one of their first objectives is to expand their influence beyond a specific field, target audience, and industry. People like Guy Kawasaki, Tim Ferries, and Tony Brown just to name a few. The target audience changes according to your goals. If his goal was making as much money as he could quickly, the best thing for him would probably be to sell large quantities to big entities like nursing-homes, organizations, and leading distributers. He would maximize the company’s value as quickly as possible and sell it fast. On the other hand, if the main objective of this entrepreneur is to help as many elderly people as possible, he should spread the message and build the company’s brand as a strong brand with a clear vision. So, in order to find the best target audience for your business or company, clarify your objectives and goals first. The second step is to define who the initial and secondary customers will be. Those customers will adopt your product or service first, and will be the first to spread the word about your new product. Which brings me to the adoption curve of Everett Rogers. Professor Everett Rogers explained it in his book, Diffusion of Innovations, published in 1962. Rogers says that the people that are more active in seeking a solution will adopt a new innovation, and willing to take the risk of trying something new. These are the innovators, a small group of your target audience. 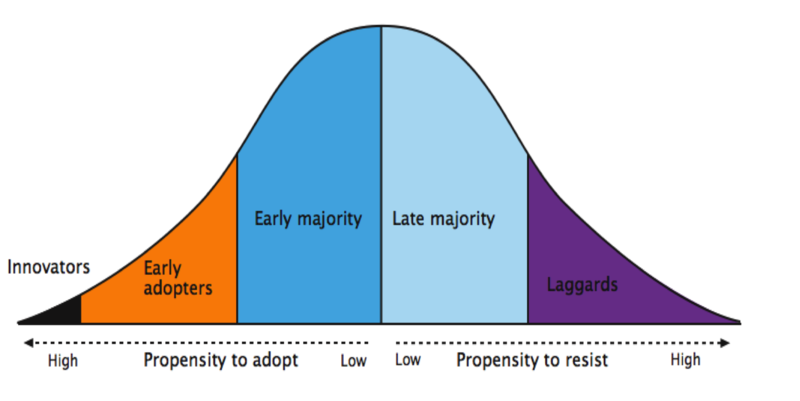 After the innovators will come the “early adopters”, which is a bigger group and then the mass market – the early and late majority of the market. First, there are the innovators or the seekers – those who are looking for new features, new capabilities, and new products. They will probably be the first target audience and there are usually not many of them. What we are looking for are those that are most likely to use our product and spread the word. Important note: One can be among the innovative users for natural health products while being part of the late majority when it comes to fashion or to new mobile phones. Now, you know what you want to achieve and who the potential customers are. What’s the connection between the marketing activities that will bring the customers and how happy will the customer be to pay? You are part of a group of friends that want to buy a special gift for a good friend of yours. And you were chosen to buy it. You don’t have the time nor the mood to stand in long lines or search the internet for hours trying to find rare tickets for their favorite band. Suddenly a banner pops up and suggests you join the band’s loyalty club and as a sign of appreciation you will get direct access to the tickets. At that moment you are, for sure, happy to pay for the tickets. If you understand your customers’ passions, pains, and needs, you will be able to create free, useful content they need, a funny video that talks about their daily habits, and other ways that will make them want to work with you and buy from you. And you will enjoy not only customers that will be happy to buy from you but also customers that will do their best to help you succeed.